TOY KINGS ARRIVES Marx Toy Kings Volume 1: 1919 - 1964 has arrived and is now shipping ahead of schedule in deluxe hard cover to collectors across the United States as the first real book on Louis Marx, the company, and the development of the Marx playset from its earliest days complete with all the juicy details you have always wondered about! Lush, full color throughout, lavishly illustrated. "I send you thanks, in more ways than my vocabulary is capable, when the Marx Toy-Quaker Oats demise occurred, I believed the “sands of time” buried Louis Marx & Co....In “Playset Magazine”, great DVD’s/Videos, and now, the fantastic MARX TOY KINGS: VOLUME ONE, today, the company lives on, and is alive and well. A specific thank you for the lovely inscription in the book you sent. We’re preparing our family”s Christmas list, and you have made shopping for them very easy!" 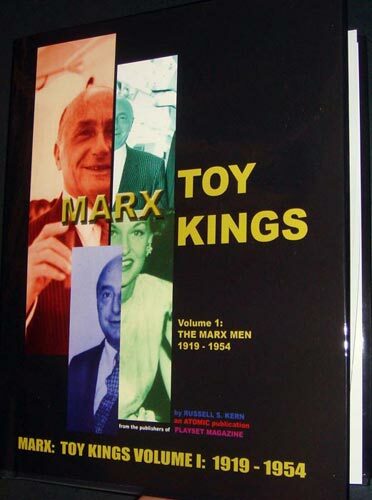 Marx Toy Kings Volume One and Volume Two Available Now! 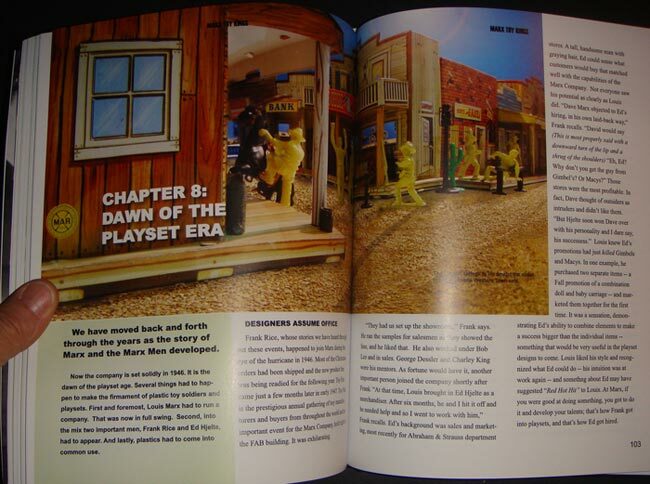 After ten years of research and interviews, Rusty Kern, publisher of Playset Magazine brings the full story of Louis Marx and Company to the page in an exciting, profusely illustrated glossy hard cover book. Volume 1 finds a young Louis Marx clawing his way to the top of the toy industry, battling the competition to produce what he calls the "Red Hot Hit." Through luck and intuition he hires exactly the right men to form a team which invents and produces the playset which becomes the favorite toy of baby boomers -- its genius is in combining plastic figures of Army men, cowboys and Indians or Colonial Troops with appropriately scaled accessories such as horses, cannon, tanks and forts, trees and more into one box. The book shows for the first time personal records and memos from the scrapbooks of Louis Marx and is the undisputed final word in the story of the company because it is in the words of the men who lived it, his original historic legends, the Marx Men themselves. Volume 1 takes you for the first time in book form into the legendary halls of Marx to see how the playset was developed; how Louis Marx sold them to sears to become his greatest Red Hot Hit, and how he refused to use advertising to manipulate a child's desires. However his competition has no such concerns and are surging into kid's living rooms as the age of television advertising booms. This will be Louis' greatest battle, even as his team is producing their greatest creations ever.